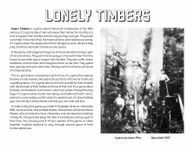 Lonely Timbers is a game about historical lumberjacks in the 19th century. It’s a game about men who leave their homes for months at a time to support their families with the only job they could get. They would cut timber in the chill of fall, the frozen winters, and treacherous spring. It’s a game about the people who did this dangerous work, the price they paid, and the bonds built in those remote cabins.